Eighty years ago, Barcelona’s calamitous May Days sealed the fate of a worker-led social revolution. George Orwell was there to bear witness. 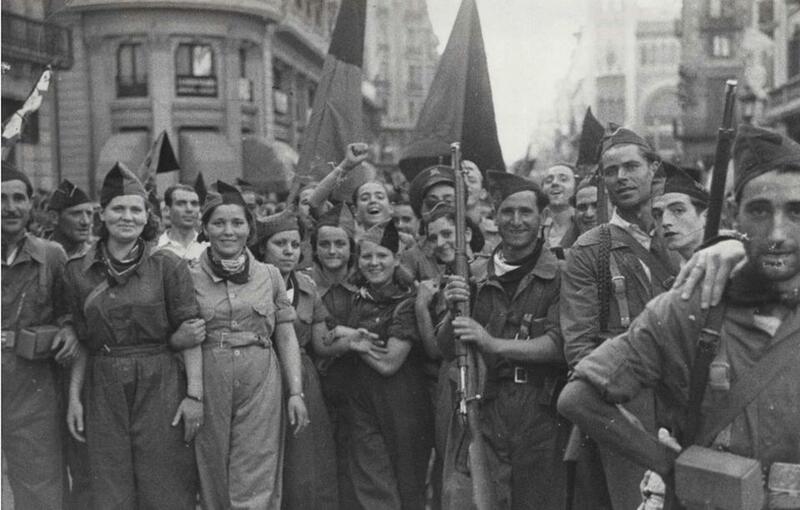 Anarchists march on the streets of Barcelona during the Spanish Civil War. The civil war had been triggered by an attempted right-wing army coup in July 1936 against the elected, left-leaning Republican government. Only half-successful, rebelling army garrisons were resisted in key cities like Barcelona and Madrid — not, by and large, by the Republican Government, but by the spontaneous resistance of Spain’s well-organized workers and sympathetic police. The unfinished coup having split the country in two, the stage was set for a protracted military conflict. From 1936 to 1939, Spain commanded the world’s attention, playing out the West’s anxieties over the rapid rise of fascism as Europe and America nervously looked on. The Nationalists, as the side of the army rebels came to be known, represented Spain’s forces of reaction: the land-owning class, industrial bourgeoisie, the Catholic Church, and Fascists, eventually coalescing under the iron rule of General Francisco Franco. Aided by Hitler and Mussolini, Franco’s Nationalists conducted their “holy crusade” in the name of order and a return to tradition against the Republic. Opposing Franco, a “Popular Front” bound the liberal elements of the loyal remnants of the middle class into an alliance with Spain’s radical left — an assortment of labor unions and affiliated socialist, anarchist, and Communist parties — which had risen to oppose the right-wing coup. Where the Nationalists were successfully fended off in Spain, workers declared revolution. Unions collectivized farms and key industries, directing their labors toward the war effort. Workers’ patrols replaced police forces, and militia columns rushed to meet the Nationalist threat. This social revolution on the Republican side of Spain was carried out furthest and lasted longest in Catalonia, and by the time of Orwell’s arrival in Barcelona at the close of 1936, an estimated three-quarters of the Catalan economy was humming under worker self-management. Even luxury hotels like the Ritz had been turned out to serve as hospitals and militia barracks, their elegant dining halls transformed into canteens serving blue-overalled workers and the family of militia fighters. Waiters and shop-workers looked you in the face and treated you as an equal. Servile and even ceremonial forms of speech had temporarily disappeared. Nobody said “Señor” or “Don” or even “Usted”; everyone called everyone else “Comrade” or “Thou” … In outward appearance, it was a town in which the wealthy classes had practically ceased to exist. Except for a small number of women and foreigners, there were no “well-dressed” people at all. Practically everyone wore rough working-class clothes, or blue overalls or some variant of militia uniform. Above all, there was a belief in the revolution and the future, a feeling of having suddenly emerged into an era of equality and freedom. Human beings were trying to behave as human beings and not as cogs in the capitalist machine. All this was queer and moving. There was much in this that I did not understand, in some ways I did not even like it, but I recognized it immediately as a state of affairs worth fighting for. Homage to Catalonia is more than a soldier’s reflections of war. A testament to the Spanish war’s early influence on the author, Homage sheds light on the Orwell’s political development and the source of the deep suspicion of authoritarian communism, hallmarks of later classics. More significantly, Orwell’s account is a lasting reminder of a chronically misrepresented chapter of history. Still today, the revolution remains conspicuously underrepresented if not absent from the dominant historical narrative of the Spanish War as “freedom vs. Fascism,” a prelude to World War II. Undermined from the start by class and political opposition, the Spanish revolution’s ultimate tragedy lies in the way it was undone well before Franco declared victory. Homage contains all of this, but is above all a love letter to this revolution as Orwell came to know it. Vividly, the author brings to life for his reader the daily aspect of life in the most profound worker-led revolution Western Europe has ever seen. The revolution that so moved Orwell upon his first impression in 1936 had a defining characteristic that set it apart from other revolutionary episodes like the 1871 Paris Commune or the early days of the Russian Revolution. The Spanish working classes rose spontaneously against the military coup without any centralized coordination, the result of six decades of tireless anarchist agitation, organizing, and education. In many respects, the revolution of 1936 was the culmination of the libertarian socialist vision that generations of anonymous rank-and-file activists had hoped and strived for. Spanish anarchism adhered to a libertarian communist vision for society according to the work of theorist Mikhail Bakunin. Bakuninist ideals reached Spain by way of Italy, grounded in the principles of worker self-management, mutual aid, and decentralized (as opposed to hierarchical) organization. While Marxist theory envisioned a proletariat “disciplined, united, organized by the very mechanism of the process of capitalist production itself” wielding the state apparatus to bring about socialist revolution, anarchist theory advocated replacement of the bureaucratic state apparatus with federated networks of autonomous, directly elected assemblies organized by trade and locality. On the global stage, these competing visions within the organized labor movement came to a head at the Hague Conference of 1872, where Marxist doctrine prevailed and Bakunin and his anarchists were expelled from the International Workingmen’s Association, or the First International. At about the same time, the labor current in more “backward” Spain was shifting decisively in the opposite direction. In the rugged isolation of Spain’s poor mountain villages, early anarchist adherents pioneered the organizational forms that later shaped the Civil War-era trade unions and peasant assemblies. These “conscientious workers” labored during the day, attended assemblies by evening, and in their leisure hours read and disseminated the writings of Bakunin alongside the rest of the liberal canon from the Enlightenment onward. In place of the Catholic faith they abandoned, these first Spanish anarchists devoted themselves to promulgating and realizing “the idea.” Their efforts forged a home-grown strain of libertarian revolution that tinged the radical left in Spain for generations. More economically developed than most of quasi-feudal Spain, the Catalan region had long been a stronghold of the country’s radical left. From the time the country’s nascent labor organizations first convened the Congress of Barcelona in 1870, through the so-called Tragic Week of 1809, when anti-conscription workers’ riots against the colonial Rif War were violently suppressed, Barcelona bore a revolutionary mantle. Under the Republican government preceding the civil war, union membership swelled into the millions, with the anarcho-syndicalist CNT dominating in Catalonia. Periodicals like the CNT’s “Solidaridad Obrera” freely disseminated revolutionary ideology to a highly conscious working class. The electoral victory of the Popular Front at the outset of 1936 emboldened the workers’ unions enough to spontaneously proclaim a “People’s Olympiad” in protest of the games held that year in Nazi Germany. So it was that, in the summer of 1936, as the specter of fascism was descending on the continent, Barcelona was set to host an unprecedented celebration of international worker solidarity. The army uprising, however, broke out just days before the torch lighting ceremony. The time for Barcelona to protest fascism had gone; the moment to take up arms against it had arrived. When the trouble started [the government’s] attitude was weak and hesitant, so much so, indeed, that Spain had three premiers in a single day. As soon as the rising broke out the organized town workers replied by calling a general strike and then by demanding — and, after a struggle, getting — arms from the public arsenals. If they had not acted spontaneously and more or less independently it is quite conceivable that Franco would never have been resisted. It was the kind of effort that could probably only be made by people who were fighting with a revolutionary intention … I[t] would be hard to believe that the Anarchists and Socialists who were the backbone of the resistance were doing this kind of thing for the preservation of capitalist democracy, which especially in the Anarchist view was no more than a centralized swindling machine. And he was right. Once workers’ groups had put down the army uprising in Barcelona and across Spain, they began to construct a radically new social order. By the time Orwell turned up in Barcelona six months later, he could rightly observe that “most of the actual power was in the hands of the Anarcho-Syndicalists, who controlled most of the key industries.” In Catalonia, this process went further and lasted longer than in other Spanish cities. In Homage to Catalonia, Orwell admits how readily he bought into what he called the “News Chronicle–New Statesman version of the war,” the over-simplification pitting freedom against fascism. It was a narrative conspired to downplay the reality of a workers’ revolution in Spain to the world looking on. The author’s time on the ground proved a rapid political education. First in the “freezing trenches” of the front, and later when “dodging communist bullets” behind workers’ barricades of Barcelona’s streets, Orwell would receive his schooling. The revolutionary atmosphere of Barcelona had attracted me deeply, but I had made no attempt to understand it. As for the kaleidoscope of political parties and trade unions, with their tiresome names — PSUC, POUM, FAI, CNT, UGT, JCI, JSU, AIT — they merely exasperated me….I knew that I was serving in something called the POUM, but I did not realize that there were serious differences between the political parties. When Orwell finally found the war he’d so eagerly sought, his expectations were soon disappointed. For three and a half months, Orwell served on the Aragon front, at that time manned mostly by voluntary militias like the Marxist party he served under, the POUM. The militias were built on democratic organizing principles, electing officers from their ranks who held no special privileges nor received higher pay. Having hastily formed the Republican defense at the war’s outset, these militia were largely an untrained rag-tag army, beset by every logistical challenge conceivable in war but high on revolutionary morale. Orwell offers no shortage of complaints for his time at the front — of cold and discomfort, of poor militia discipline and organization, of dismally outdated weaponry. Above all, he reports an overwhelming idleness, far as he was from the principal fighting at that time around Madrid. For weeks on end, during the dull period when nothing was happening … I found myself in the middle of a political discussion that practically never ended … [I]n the stuffy blackness of dug-outs, behind the parapet in the freezing midnight hours, the conflicting party “lines” were debated over and over. The list of differences between the far-left’s rival factions was exhaustive. They’d only laid their competing aims aside in the face of an existential Nationalist threat. The “Stalinist” PCU and PSUC distrusted the rival nonconformist POUM, all Marxist political parties but differing over the formers’ adherence to the Stalin-backed Comintern in Moscow. Anarchists, meanwhile, holding to their libertarian principles, were nearly as distrustful of Marxist bureaucracy in any form as they were of bourgeois capitalism. The question looming largest in the Republican camp was the unsolved question of the revolution. From the start, the Popular Front was an uneasy alliance between the left-wing revolutionaries and the Republican loyalists, Spain’s political left-center which opposed the military coup. Effectively, it represented the liberal bourgeoisie and the middle class, each intensely wary of any workers’ revolution. They had good cause to be — throughout Republican-held Spain, wherever workers took control, varying degrees of “Red terror” followed. Tens of thousands of civilians were killed by mobs, firing squads, and assassinations — not just known and suspected Francoists (tactics pervasive on both sides of the Civil War), but landowners, industrialists, politicians, and the vast majority of the Catholic clergy in Republican-held zones. At best, the loyalist government could be described as reluctantly complicit in arming the workers, and now had to hold together these contentious sides against a common foe with clear military advantages. The two factions agreed only on the ultimate priority that the war must be won, and to that end, the government side began to seek centralized command of the war and the redistribution of worker militias into their newly formed Popular Army. The revolutionary counter-argument, summed up by the POUM slogan that “the war and the revolution are inseparable,” insisted that the workers should not surrender the precious arms, industries and military commands they had won by opposing the uprising. The Anarchists and other left-wing Socialists all fell with the POUM into this revolutionary camp. The Communist Party stood against the revolution for most of the war, and the party’s growing influence would prove decisive. The Communist line advocated discipline and subordination of revolutionary aims to the war effort and government, even if that meant accepting bourgeois capitalism for the time being. This stance was in line with the policy of the Comintern in Moscow dictated by Stalin. The policy served his international interest in wooing Democratic allies against Nazi Germany, insisting that the Popular Front appear as a respectable, capital-friendly state actor. This played to the the cold calculus of the Stalin’s grand geopolitical ambitions. Following the example of Soviet purges against anarchist or noncomformist “uncontrollables,” Communist policy in Spain worked to systematically undercut radical rivals, taking advantage of the Civil War to consolidate power. Despite Orwell’s lack of interest in Spain’s political complexities, they were deciding the course of events in Spain all the same, providing crucial support to the Republicans. In besieged Madrid, the defense against the Nationalist advance had grown so desperate that the Republican Government fled the city for safety. State-of-the-art arms and military advisors pledged by Stalin arrived from Russia just in time to stem this tide. A column of international volunteers, organized in large part by the Comintern, arrived at the turningpoint. The part of these well-trained and battle-tested internacionales in saving Madrid was valiant and highly visible, fueling Communist propaganda that only their brand of disciplined subordination could possibly oppose Franco. As the loyal middle class swelled party membership, Communist influence in the Republican Government steadily increased. All the while, the revolutionary militias scrabbled through the cold Aragon winter with outdated rifles and precariously unreliable grenades, awaiting Soviet weapons and a renewed offensive which never arrived. For his part, Orwell would realize only later that this plight was no mere coincidence, but deliberate policy to fight the war against Franco while systematically disenfranchising the revolution. Behind the lines, the government gradually asserted control over industry and trade in what was labeled a “policy of pin-pricks.” Every move, whether to break up a militia into the Popular Army, or to put some vital collectivized industry under central control, was carried out ostensibly in the name of the war effort. At each turn, Orwell explained, something “demanded by military necessity was the surrender of something that the workers had won for themselves.” They could hardly protest; victory against Franco was every bit as crucial to the revolutionaries, if not more so. Throughout his time at the front, Orwell dismissed the Popular Front’s internal struggles as trifling political feuds. It was only once he’d left the front that he began to understand just how valuable his time there had been. Everyone who has made two visits, at intervals of months, to Barcelona during the war has remarked upon the extraordinary changes that took place in it … the revolutionary atmosphere had vanished. The militia uniform and the blue overalls had almost disappeared; everyone seemed to be wearing the smart summer suits in which Spanish tailors specialized … A deep change had come over the town … the people — the civil population — had lost much of their interest in the war … the normal division of society into rich and poor, upper and lower class, was reasserting itself. The timing of the author’s leave to Barcelona is one of those remarkable accidents of history. The trouble came in what are now remembered as the May Days of 1937, a propitious series of events that would prove decisive for the revolution in Catalonia. As May 1, International Workers’ Day, was approaching, Barcelona’s labor unions had planned a massive demonstration of solidarity with the revolution. However, with political tensions coming to a head, at the last minute the demonstrations were cancelled. Violence was sparked by the attempted seizure by Civil Guards of the city’s Telephone Exchange, a strategically crucial operation collectivized at the outbreak of the war that had remained under anarchist CNT control ever since. When the police force came to seize the Exchange, CNT guards resisted. The gunfight was interpreted by the city’s workers as a clear opening move against union control, something that seemed inevitable amid the city’s rising political tensions. Defensive positions were taken, and within two days, the various factions within the city took up arms and raised barricades in the streets. Las Ramblas, Barcelona’s central artery, became a virtual no man’s land. It looked like what leaders on all sides had been dreading: a civil war within the Civil War. Orwell stood guard with his POUM compatriots, who mobilized in solidary with the CNT. Though Orwell recalls the mutually defensive stances of the POUM and the Civil Guards, it was not so in other parts of the city. In total, at least five hundred lives were lost to internecine fighting in the May Days. The Republican government sent thousands of troops into Catalonia to restore order, but by the time they arrived, the workers’ barricades had already been abandoned. Once it had become clear that the telephone exchange was not the beginning of an all-out assault against worker control, union leaders worked hastily to restore peace. They urged their members at the barricades to return to work and the militias to remain at the front. Placing faith in the united front against Franco, the revolutionary camp gave in to government demands. The policy of pin-pricks had won out once more. For the revolutionary holdouts in Catalonia, the May Days were the beginning of the end. In the weeks that followed, Orwell explains how the work of counterrevolution was carried out in Catalonia. The Barcelona fighting had given the [Republican] government the long-wanted excuse to assume fuller control of Catalonia. The workers’ militias were to be broken up and redistributed among the Popular Army. The centralization of worker-run industries was continued. Through a vociferous Communist propaganda campaign, the POUM was labeled the scapegoat of the May violence. The rival Marxist party was accused of inciting the uprising in coordination with the Fascists, and Communists called for POUM to be outlawed. The Communists’ protests precipitated a government crisis in Madrid, resulting in a shift further to the right, and the further consolidation of Communist power. As the POUM was outlawed, a string of political arrests swept the city. The party’s leader, Andres Nin, was taken into Government custody and never afterward seen or heard from. Shocked, Orwell himself felt endangered by his association to the POUM and was compelled to flee the country. Having dealt with their Marxist rivals, it was only a matter of time before the Communists moved against the anarchists as well, dismantling revolutionary power in the name of an increasingly dim prospect: victory. Russian military aid had arrived in the Republic’s most desperate hour, providing essential arms and munitions the Republican side proved utterly incapable of mustering on their own. While it lasted, this aid was an essential counterweight to what the other side was provided by Hitler and Mussolini. But heroic as the militias had been in resisting the initial uprising, their prospects in a conventional war against Franco and his fascist backers were overwhelmingly dim. Stalin’s planes and tanks came with considerable strings attached. The price turned out to be more than just Spain’s famous gold reserves, but submission to Soviet-Communist interference in Spanish politics. Necessary as the disciplined Communist approach may have seemed for the war effort, it was far from pure in its motives. Decisions by the Republican government to keep power from its perceived rivals — the refusal to evacuate a vital cartridge factory to Catalonia, for example, rather than surrender it to Franco — at times precluded the war itself. In the end, Soviet aid and Communist discipline was not enough. For his part, Orwell concluded that from the start, the war had been “essentially a triangular struggle.” The May Days had proved the revolution’s death knell. History would not only uphold Orwell’s judgment of Communist motives and the role of the USSR. Secret Soviet documents revealed only in 2003 proved that these betrayals went even further than Orwell had surmised. Elimination of the POUM was undertaken methodically under official Communist policy. A party meeting swayed by Russian influence had decided shortly before the May Days to bring the looming confrontation to a head. Andres Nin, the POUM leader whose arrest and disappearance spurred outcry in Barcelona, had resisted torture and was ultimately killed by agents of the Soviet Union. Nin was not alone. 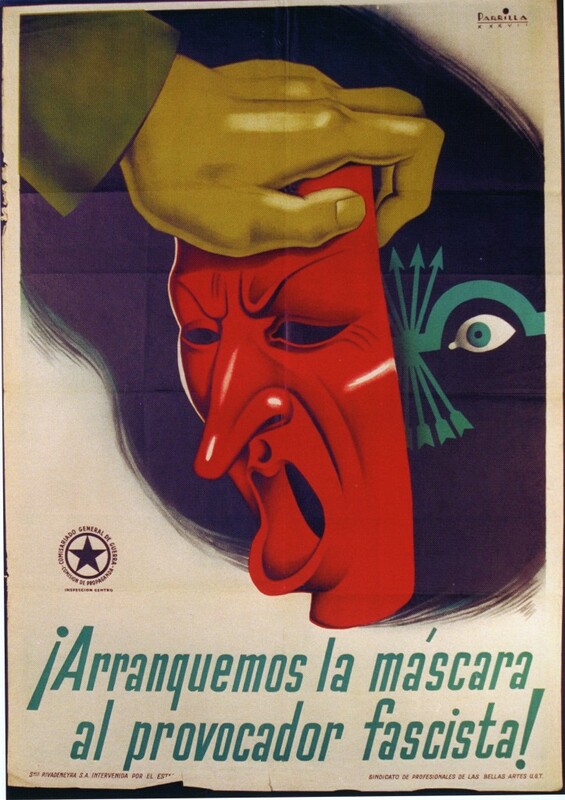 From the outset of Russian aid, Communist policy in Spain, answerable to Moscow, called for the elimination of rivals to Stalin’s own authoritarian brand of communism. Compared to the complicity with which the Soviets later abandoned the Spanish cause to suit his 1939 pact with Hitler, we’re left to assume this suppression of “uncontrollables” ultimately became Stalin’s priority in the Civil War. The remarkable events he’d taken part in had left Orwell, in one sense, deeply disillusioned. The readiness with which the outside world accepted the deliberate misinformation of those events left the writer utterly bewildered. “The foreign capitalist newspapers” he wrote, unfairly laid the blame on the anarchists. Even worse for him were the Communist and pro-Communist papers back home blaring that the POUM had orchestrated insurrection to throw the war to Franco. All the same, Homage is more than just a journalist’s hasty attempt to set the record straight. As an indictment of authoritarianism and misinformation, it marks a turning point in Orwell’s immeasurably influential literary career. Above all, it is a lasting tribute to the dreams and ideals of the collective spirit, manifested however briefly and ominously in a radical experiment in egalitarian, libertarian social change. Eighty years on from the May Days, Homage to Catalonia remains an accessible entry-point into the true story of the Spanish revolution. It’s a story that warrants remembrance today, not least for the complicity in which the watered-down version of the Spanish war continues to be handed down in classrooms and popular culture. In the 1960s, Murray Bookchin argued that radicalism of the Spanish flavor was uniquely suited to modern problems of state centrism, managerial control, and bureaucracy. The revolution not only posed an alternative vision to address these concerns — it actually achieved alternative modes of self-managed and democratic organization, and began sorting out the kinks of a new system aimed at the old unquenchable idea: a more egalitarian, more libertarian society. Jared Spears is a writer based in Brooklyn.